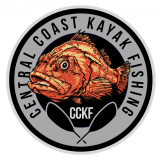 Who is gonna take home the title of Biggest Lingcod at this years Central Coast Slam Down? Only one month from today, last day to register and still receive a shirt and captains bag is August 27th. 2 weeks left to sign up early... Dont miss out we have some great prizes again this year including a all expenses paid trip to Los Buzos Panama..
Last chance to pre- register and still receive a t-shirt is tonight.